Historic theater known for playing host to notable bands, including R.E.M. (CNN) -- A bit of music history was lost Friday morning when flames gutted the Georgia Theatre in Athens, Georgia. The Georgia Theatre in Athens, Georgia, smolders after firefighters put out a morning blaze. The 19th-century building was a cornerstone in the alternative rock music scene that gave the world the B-52s, R.E.M. and the Indigo Girls, said Doc Eldridge, president of the local Chamber of Commerce. 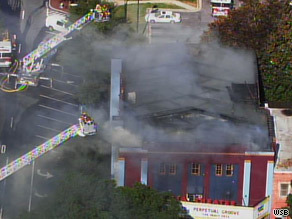 The theater, in downtown Athens near the University of Georgia campus, suffered heavy damage from the fire, which was discovered at 7 a.m., according to Athens-Clarke County government spokeswoman Sandy Turner. "The facade is still there, but it's very bad," she said. Sheffy McArthur was a University of Georgia student when he and two friends converted the movie theater into a music venue in 1978. "The B-52s paid us to play there, imagine that," McArthur said. Sea Level, a blues-jazz-rock group that grew from the remnants of the Allman Brothers Band, played the first show in the theater in January 1978, McArthur said. It became the place "for alternative music, instead of cover-type stuff for real artists to play," he said. Wilmont Greene took over the theater five years ago and began renovations. R.E.M., which formed in Athens in 1980 and became one of the first popular alternative bands, played in the 600-seat theater in the group's early days. In recent years, the theater served as host for album release parties and benefit shows by R.E.M., which is based in a building just down the street. "All of us here certainly wish Wilmont Greene and his staff the best of luck and Godspeed in their efforts to rebuild the Athens landmark," an R.E.M. statement said.